Chamara Kapugedera is a cricketer of immense talent. Having parents from a sporting background, “Kapu” took to cricket when he was only 11 and since then has never looked back. Starting off as a wicket-keeper batsman, Kapugedera was soon adjudged as one of the best talents during his school years. With a fruitful 2003-04 season under his belt where he scored over 1000 runs, he earned his place in Sri Lanka’s Under-19 team tour to Pakistan with a brilliant 131 in a game. Thereafter, he scored a fine 70 for Sri Lanka A against a strong New Zealand A outfit. The selectors took notice and he was quickly assimilated into the ODI team when he was only 18. 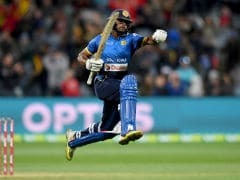 Debuting against Australia, he showed glimpses of his talent on the hard, bouncy Australian wickets alien to Sri Lanka. In 2006, he made his Test debut against England but could not retain his spot for long. He has since been part of the ODI team but inconsistency has cost him a place on several occasions. Equally strong of the front and back foot, Kapugedera is a fine mixture of elegance and power with oodles of time to play his shots. One of the best fielders in the Sri Lankan outfit, he is also a lively medium pace bowler. However his weakness is his temperament as he is prone to recklessness and has a tendency to give his wicket away easily.